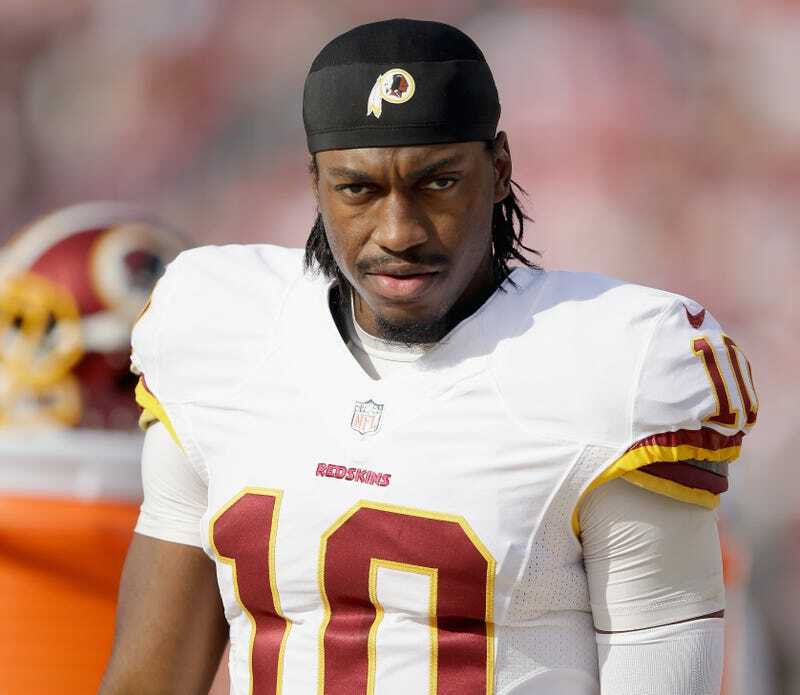 We have, unless and until Colt McCoy gets hurt, almost certainly seen the last of Robert Griffin III in burgundy and gold. Now benched for two different backups to end two consecutive seasons, there is nothing left in D.C. for the former second-overall pick. Not if Jay Gruden remains coach, and given that Griffin's benching is itself a show of support for Gruden by Dan Snyder, if one of them has to go, it's not going to be the coach. Adam Schefter broke the news last night: Colt McCoy will start Sunday's game against Indianapolis. The timing was truly bizarre. If this was the plan, why not announce it before Gruden halfheartedly endorsed Griffin earlier in the day? Or, barring that, why not wait until Griffin's teammates were told? But nothing happens bloodlessly around here. Griffin, according to Schefter, remains "a significant part of the Redskins' long-term plan," which nobody actually believes. The Washington Post's Jason Reid cites people within the organization who say it's "highly unlikely" that Griffin returns. Mike Florio says the bluster about the future is just a desperate attempt to maintain Griffin's trade value. Whatever they get, it'll be a pittance compared to the three first-round picks and one second-rounder they sent the Rams for the right to draft Griffin. These three seasons are the Skins' lost years; incomplete draft classes, less-than-full salary cap space, and a presumed franchise quarterback who wasn't even good enough to hang on to his job until reinforcements could arrive. I do wonder how posterity will characterize Griffin's failure in Washington. Was he just a bad quarterback? Or did the Skins ruin him? Until the last few weeks I would have said the latter. Nothing about his incredible rookie season seemed like a fluke—he was as poised and as exciting as any young QB had been in years. And then he ripped up his knee against Seattle, in a game he maybe should have pulled from earlier, and he's never been the same. He's simply not running anymore, and that lack of explosiveness—or maybe it's just being gun-shy—has led him to take sacks at historic rates. But then you watch him play, and you see that he's not having success for really basic reasons that can't possibly have anything to do with his physical condition. His reads and his progressions are, at times, nonexistent. Chris Cooley spent a half-hour breaking down tape of Griffin, and it's the single most damning indictment of the quarterback's abilities I've seen to date. The Cliffs Notes version is this tape study at Yahoo, specifically this one play that saw five separate receivers come open at the same time. Griffin found none of them. He stepped up into pressure and threw the ball into the ground as he took a big hit. Griffin might be unsalvageable, but he's so young that I have to doubt it. More importantly, at least some other teams around the league must doubt it too. He's going to get his chance somewhere else. With the Jets? The Eagles? The Cardinals? If you have fond memories of the player RGIII was and once promised to be, you should want him to go somewhere quiet, somewhere nurturing, somewhere nontoxic. A divorce from D.C. is probably best for everyone.